The draw for the European Qualification Round was carried out in Vienna. The 2011 Men's World Championship (IHF event) will take place in Sweden. European national teams will have a total of 14 places at the Final Tournament. The draw for the European Qualification Round was carried out on 6 August in Vienna. To check out the draw results, please click here. The organisation rights of the Qualification Round groups were alos decided by draw. The first right to organise went to Row 3. In practice, Cyprus, Finland, Bulgaria, Belgium, Italy, Luxembourg and Turkey can decide to organise the tournaments. If these Federations do not want to organise, the right will be passed on to the teams of Row 1, Row 4 and finally Row 2. The qualification matches between the 23 national teams involved will be played in 5 groups of 3 teams and 2 groups of 4 teams. The winner of each group will qualify for the play-off matches, which will be played on 12/13 June and 19/20 June 2010. The qualification Europe for the 2011 Men’s World Championship will basically be played in form of tournaments within one week at one venue during the week of 11 to 17 January 2010. 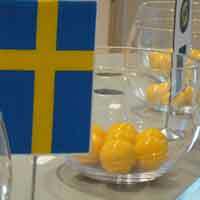 Apart from the defending champion (France) and the organiser (Sweden), the three best ranked teams at the EHF EURO 2010 in Austria will directly qualify for the final tournament in Sweden. The other 11 teams from the EHF EURO 2010 will have to secure their places at play-off matches. The draw for the Play-off will take place on 31 January in Vienna.